If you think this is another one of those stories about a young man named Gottlieb or Heinrich or Bernhard or Conrad who boarded a ship from Der Vaterland in the middle of the Nineteenth Century and came to America to establish a lager brewery in the Midwest, you’re dead wrong. CHARLES LOUIS CENTLIVRE was french, Monsieur Centlivre (His surname has been anglicized to rhyme with "river") was born in 1827 in Lutran, a small town in the northeast of France about nine miles from the German border and 90 miles south of the 349-year-old Kronenbourg Brewery in Strasbourg. When he was 12, his family father, stepmother, five siblings and a stepbrother-moved to neighboring Valdieu, where he apparently apprenticed as a cooper. Charles, along with his sister Celestine and stepbrother Henri Tonkeul sailed from France and arrived in the Port of New Orleans on December 24, 1850. Charles and Henri would soon relocate to Louisville, OH near Canton (now home of the NFL Hall of Fame), where they reportedly met up with other relatives, and where Charles found work as a cooper. In 1854 they were joined by Charles' father, stepmother and younger siblings. It was here that Centlivre wed Marie Houma ire, a young French woman who spoke no English. The newlyweds had met by accident on a train reroute to Louisville. Marie had boarded the wrong train; she was supposed to be heading to Louisville, Kentucky' Late in 1854 or early 1855, Charles and Marie moved to McGregor, Iowa, where he purchased some land. McGregor, located on the Mississippi, was becoming a hub where grain from Iowa and Minnesota was transported across the river and sent on to Milwaukee via railroad; by the 1870s it had become the busiest shipping port west of Chicago. A number of family members also moved to Iowa, including Centlivre’s brothers Francois and Denis, sister Celestine and his father Louis. Marie gave birth to their first two children, Amelia and Louis, in Iowa. Charles met Christian Magnus, a German emigrant and brewer, while in Dubuque County, Iowa. Magnus helped Centlivre start a brewery in Twin Springs, Iowa about 1857 and served as its foreman until 1858. Magnus was known to age beer in caves, which may be how Centlivre learned to lager beer. Also while in Twin Springs, Centlivre declared his intent to become a United States citizen. 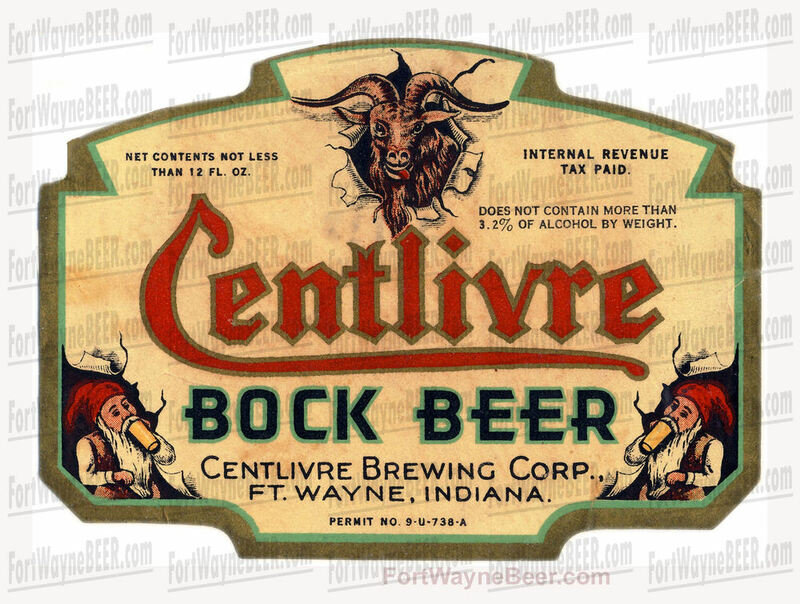 More than a brewer, Charles L. Centlivre was an entrepreneur, and while in Fort Wayne, Indiana, possibly to visit his stepbrother Henri Tonkeul, (Tonkel Road still exists in Fort Wayne), he saw a greater business potential than existed in Iowa. Fort Wayne had a large German population, a total population at the time of about 10,000, rail service connecting Fort Wayne to Chicago and Pittsburgh and three rivers from which to draw water and ice for brewing. In February 1862 he purchased 320 acres in Fort Wayne from Rufus French. Centlivre Beer was available for a modest price. The Centlivre’s had a strong interest in boating. Charles' son Joseph rowed competitively until he developed typhoid after his skiff was swamped during a race in the Detroit River. Joseph died in September 1882; just four years later Marie Centlivre passed after a brief illness. By the mid- 1880s Charles Centlivre was preparing his remaining sons to run the brewery. Charles F. was a delivery clerk and then superintendent of the bottling works; Louis Alphonse worked as the brewery manager. Daughter Amelia's husband, John Reuss, became the French Brewery's corporate secretary and treasurer. In spring 1887 construction of the C. L. Centlivre Street Railway Co. began. Two rail cars would replace the old horse-drawn trolleys that took people to Centlivre Park. The line also played a role in the brewery's business, as it carried beer deliveries to the Nickel Plate Railroad station and saloons downtown. Later that year the family celebrated another milestone. On August 6, Charles Louis Centlivre, now 60 years old, became a naturalized U.S. citizen. On July 16, 1889, tragedy struck the brewery. Shortly after 9:00 pm, a fire bell rang out, signaling that a blaze was engulfing the plant. Charles F. Centlivre reported the fire himself. It began in the boathouse, next to the brewery proper and quickly spread throughout the facility. During the fire, the refrigeration system's ammonia tank exploded. The fire department was able to save the adjacent family home, but the brewery itself was declared a total loss. The destroyed buildings were valued in the neighborhood of $350,000. Unfortunately, Centlivre carried only $20,000 worth of insurance on the plant. At the time of the fire, Charles Senior was on business in Detroit. Just a month prior to the conflagration, an English brewer had made an offer to buy the brewery. When the sale didn't go through, the Centlivre’s announced that a new brewery would be erected. Centlivre continued beer deliveries, utilizing the F. Hake bottling facility to bottle beer that was left unscathed in the cellars. Two deaths were attributed to the fire. A 17-year-old boy observing the action was killed when the ammonia tank exploded. The second fatality occurred a month later, when brewery worker Mathias Thomas was crushed by a brick wall that collapsed during the cleanup. Plans to rebuild began immediately, and within six months the new plant was in production. Brewery employees commissioned a bronze statue of Charles Louis Centlivre, which was placed atop the brewery. A January 20, 1890 Fort Wayne newspaper mentions the setting of the statue. The nine-foot-tall likeness of Centlivre remained atop the brewery until its closing. A Fort Wayne restaurant owner, Don Hall, later purchased the statue at auction. In 1974 it was placed in its current location atop Don Hall's Old Gas House Restaurant, located at the corner of Superior and Spy Run Ave., former Centlivre Manufacturing Company site. 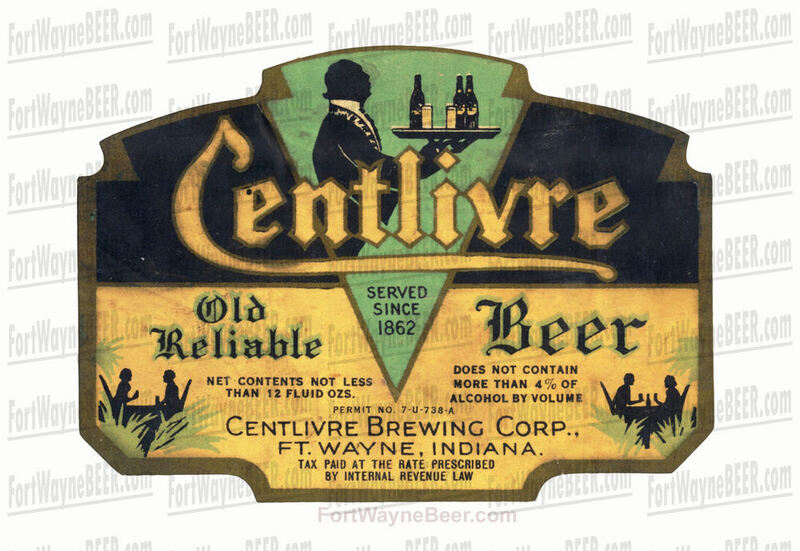 The principals of the Centlivre Brewing Co. were involved in many other endeavors-including the Centlivre Manufacturing Company, which made bicycle handle bars and chain guards, the Centlivre Hotel and the Home Billiard Hall. Most importantly, brothers Charles F. and Louis A. started the Spy Run Stock Farm, where the Centlivre Apartments are now located. The family's stock farm held a national reputation for producing fine horses. The most famous was Atlantic King, who was ranked among the fastest trotting and pacing horse of his time. One day in the late 1890s Louis Centlivre found himself on a train heading home after a horse race in Cleveland, OH. In the dining car he ordered a beer that was cloudy and did not meet his liking. 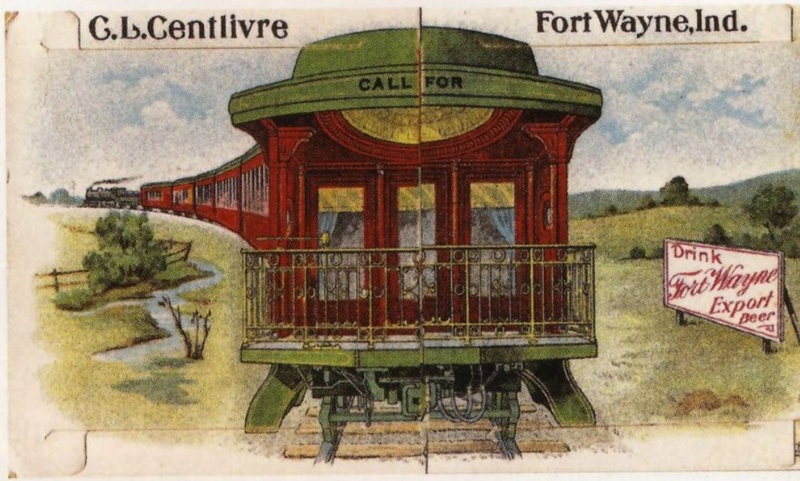 After the trip, Centlivre made arrangements to have two cases of Centlivre Special sent for the dining car steward to test on a trip back to Cleveland. 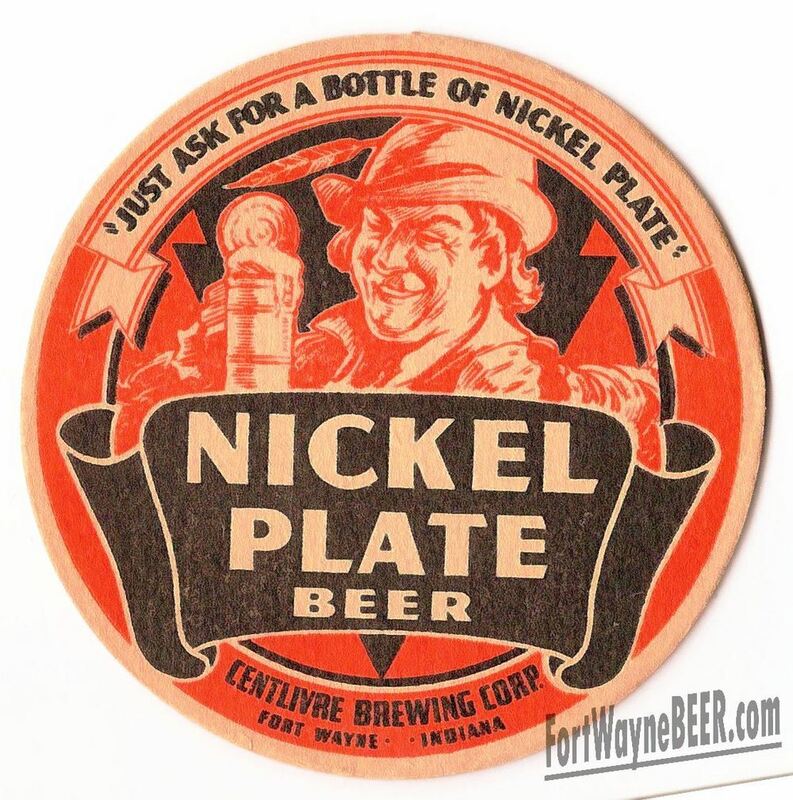 Shortly after the test, a contract was signed with the Nickel Plate Railroad to furnish beer for their dining cars, giving birth to Centlivre Nickel Plate Beer. Charles L. Centlivre retired in May of 1891, leaving the brewery to his two sons, Charles F. and Louis, and his son-in-law John Reuss. The founder received a $3,500 annual annuity from the brewery for the remainder of his life. Unfortunately, the payments lasted only three years, Charles died on January 3, 1894. 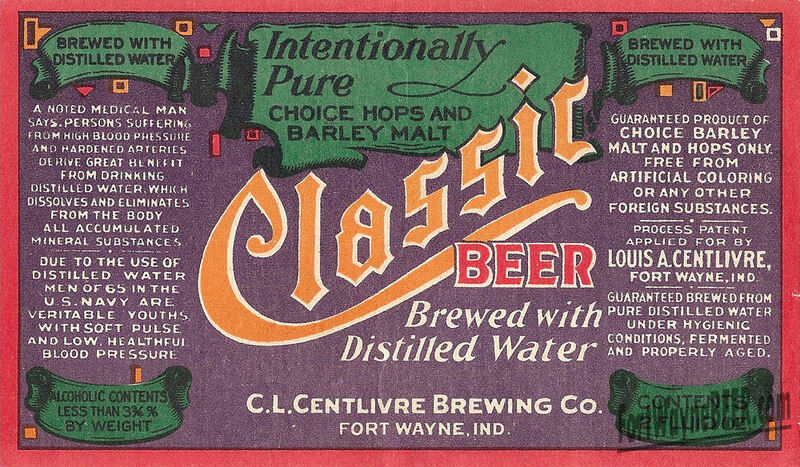 A year after his passing, the French Brewery was renamed the C. L. Centlivre Brewing Company. Between the rebuilding of the plant in 1890 and the beginning of Prohibition, the brewery remained very successful. A 1905 newspaper ad proclaimed "If you want to be well, drink beer that is pure and healthful. Our Special Export Beer is absolutely pure, properly aged and fermented, and is made from the best materials money can buy. We spare neither, care, cash nor brains, in the brewing of this perfect beer, and the rich, inimitable flavor is the natural consequence. Drink Special Export-the beer that tells. C. L. Centlivre Brewing Co. Phone 62, Made in Ft. Wayne." This ad copy ran in the 9/20/1908 Fort Wayne Journal-Gazette: "Almost any kind of beer will satisfy some people but in the home nothing but The public version of Nickel Plate Beer, which included a bock, could be found with colorful labels. The purest should be used. In our brewery cost of manufacture is a secondary consideration. First, last and all the time our constant endeavor is to produce a beer that is second to none in the world. In Bottled Form is the Ideal Beer for Home use. None but the best selected malt and hops enter into its manufacture. After brewing it is kept in storage for months to give it necessary age.” Why not keep a few Bottles ready for use in your Ice Box? Centlivre PINTS and QUARTS Phone 62. "As Prohibition loomed, the brewery began producing near beer, birch beer, and Centlivre Tonic. 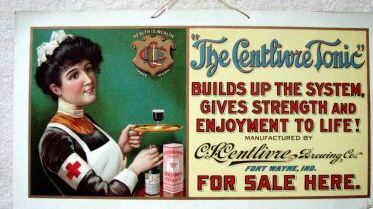 In 1918 the name of the brewery was changed to The Centlivre Beverage Company, reflecting the dry nature of Prohibition. The near beer that Centlivre produced, labeled "That's It," was not well received and was quickly dropped. 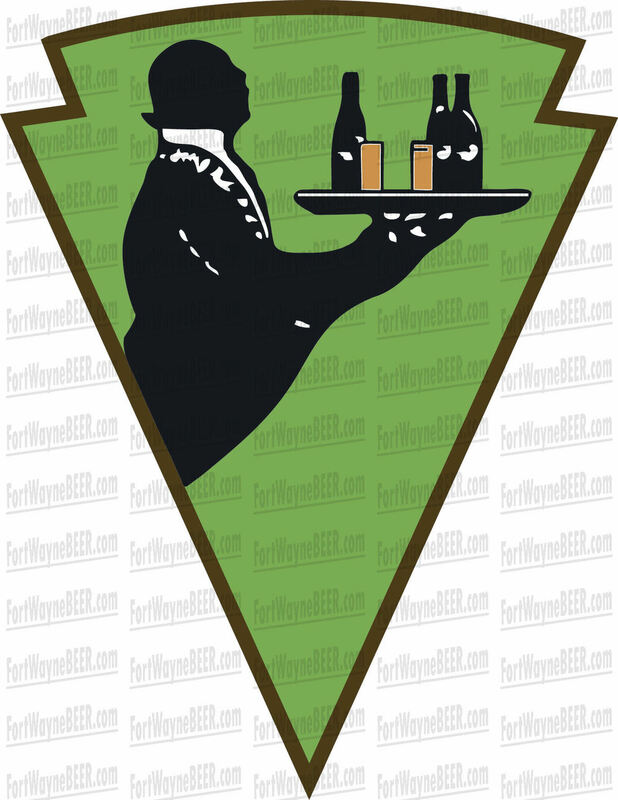 In 1919 the brewery no longer carried the distinction of beverage company. Another name change created "The Centlivre Ice and Cold Storage Co." While the Centlivre's other ventures remained successful during The Great Experiment, they were not nearly as profitable as the brewing business. The family was able to weather Prohibition and reopened the brewery on April 17, 1933. Unfortunately, Charles F. Centlivre did not live to see Repeal; he passed on November 12, 1926. John Reuss also did not live to see the return of beer, as he had died some two years before C.F. Following Repeal, Centlivre's relationship with the Nickel Plate Railroad again proved important. The brewery ordered a new boiler; however, the vessel was not delivered before the repeal of Prohibition. In February 1933 Louis A. Centlivre, now chairman of the board, and Charles J. Reuss, president, made arrangements with the railroad to borrow a steam locomotive to serve as a temporary boiler. With steam again in the pipes and beer flowing again, Frank Kloer, who had served as Brewmaster before Prohibition, resumed his role. 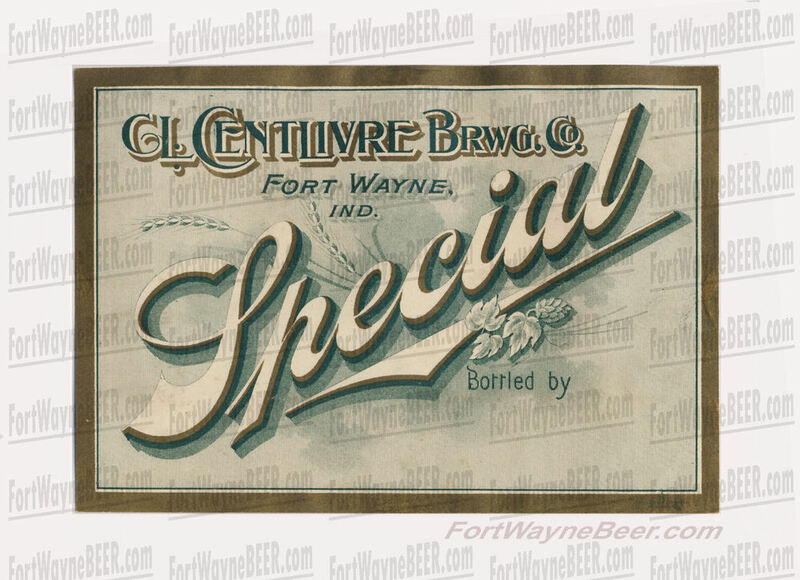 The brewery was reorganized in July 1933 and was formally named the Centlivre Brewing Corporation. 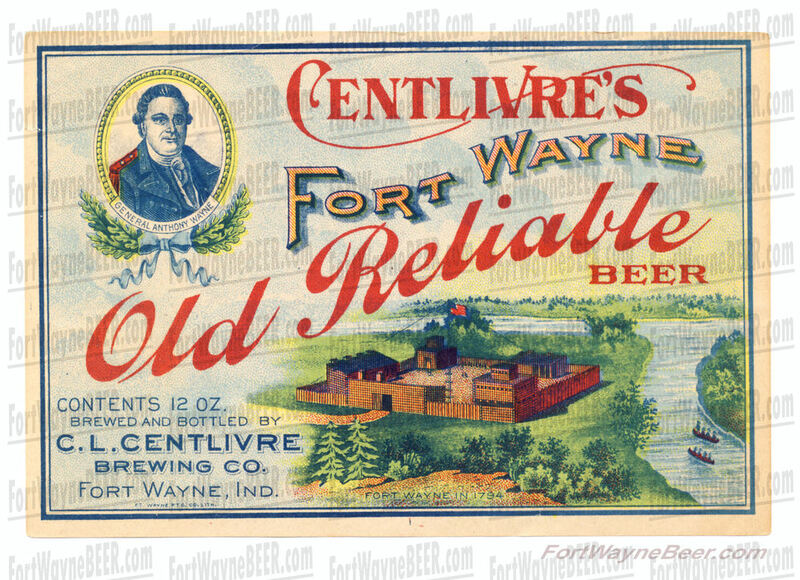 In 1934, the city of Fort Wayne boasted a minor league baseball team: the Centlivre Beers. 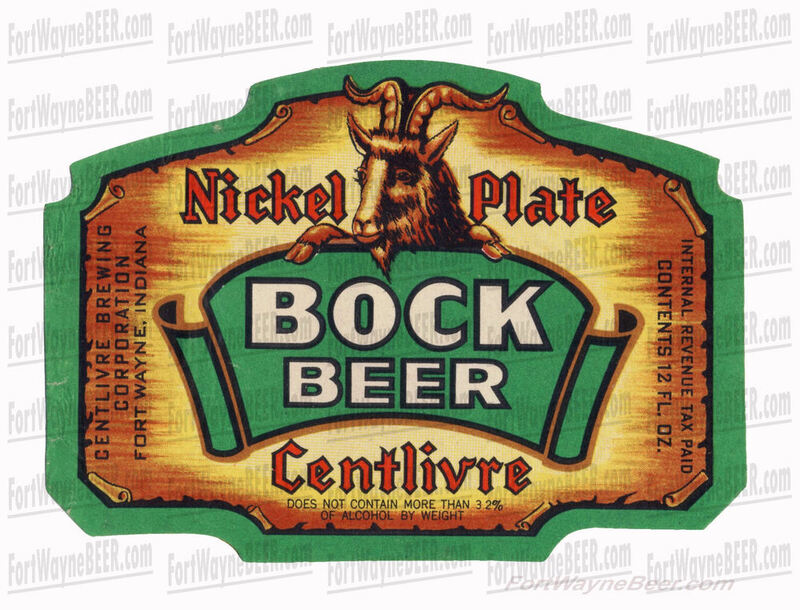 Much to the pleasure of beer can collectors, Centlivre beer was canned starting in 1937, as is evident from the "75 year" reference on the can's side panel (USBC I 48-28). 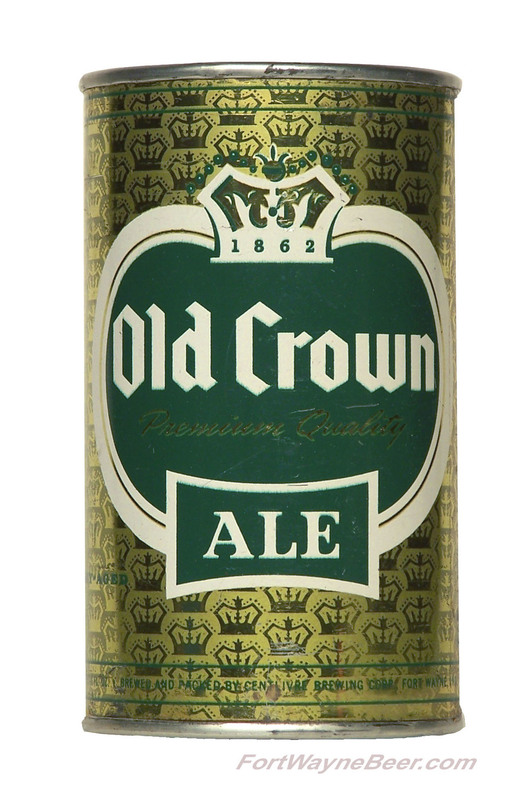 Old Crown Ale would be added to the brewery's lineup in 1939. Old Crown Ale was advertised to outsell all other Indiana ales combined. In just two years Centlivre had capped 25 million bottles of Old Crown Ale. 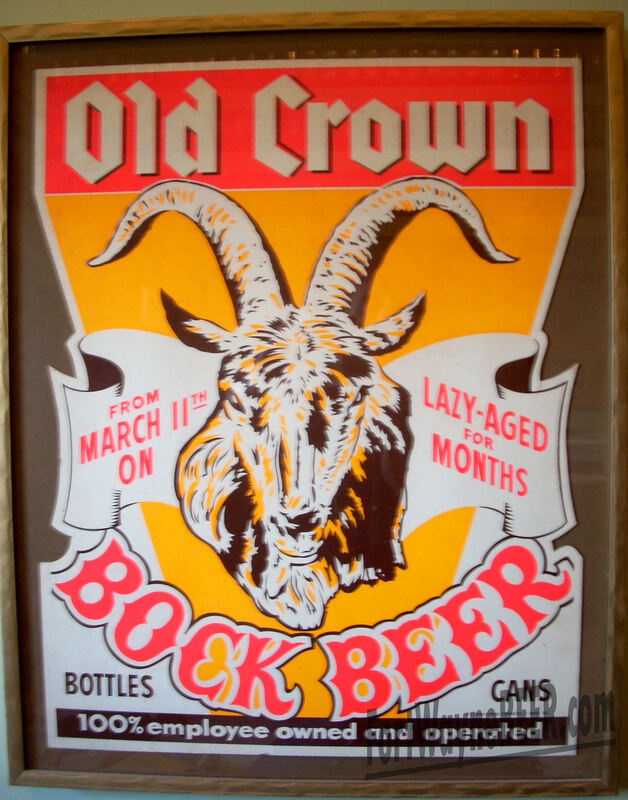 With its popularity, the Old Crown Beer label began to replace the Centlivre label. During war time rationing, Centlivre's aim was to protect the quality of its products. Centlivre's sales actually increased during WWII. During the war, Mr. Laze-E-Aged was introduced into advertising to promote the fact that Centlivre products were properly aged to assure the highest quality and flavor. After the war the brewery underwent a $1.5 million expansion, completed in 1950, which increased annual capacity to 250,000 barrels. In 1957, to celebrate Centlivre's 95th anniversary, Alps Brau became a part of the brewery's lineup. 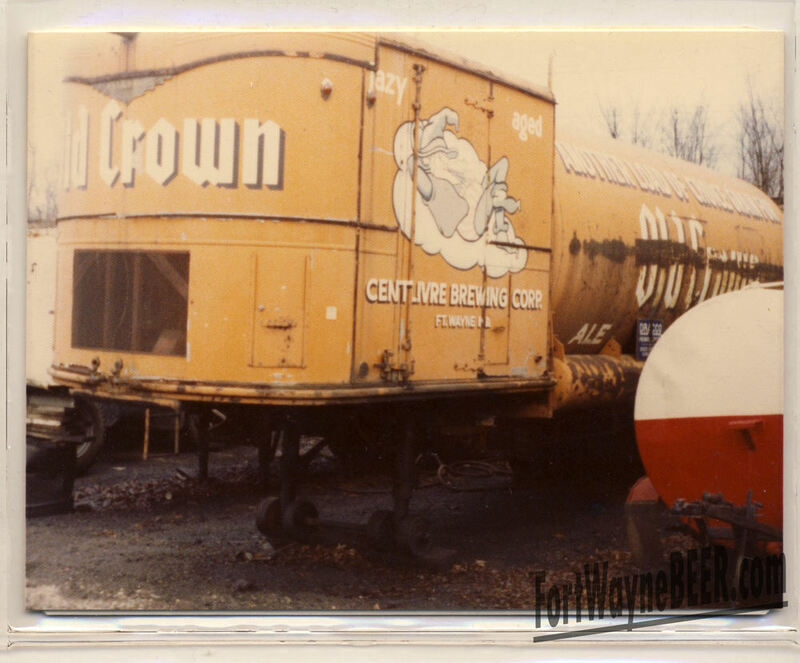 Old Crown was a part of the United Brewers of America, along with Jones Brewing Company (Smithtown, PA) and others. They shared advertising concepts and art, including "Crownie," who became Old Crown's mascot shortly before the employee purchase. At the time, the Centlivre family seemed unaware that major changes were in the offing. The 95th would be the last major anniversary under family ownership. Ownership changes began in 1958, when a group of eastern investors led by Herbert Siegel of Philadelphia gained controlling interest in the brewing corporation. 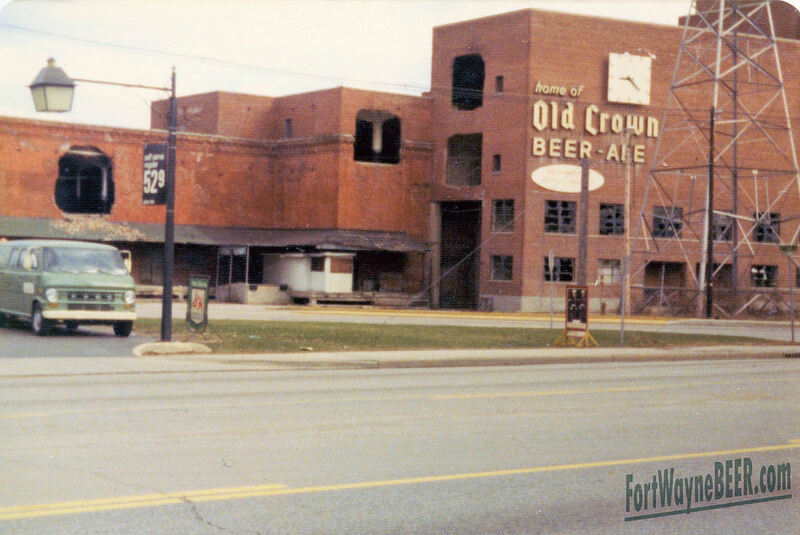 On July I, 1961 the brewery became I00% employee owned and was renamed the Old Crown Brewing Corporation. The buyout came after rumors surfaced that the brewery was to be part of merger involving a New Jersey-based chemical company. Both the Centlivre and Reuss families helped fund the employee buyout. John A. Meyers became company president and remained in that role until the brewery's closing. Harold Klink was the Brewmaster. 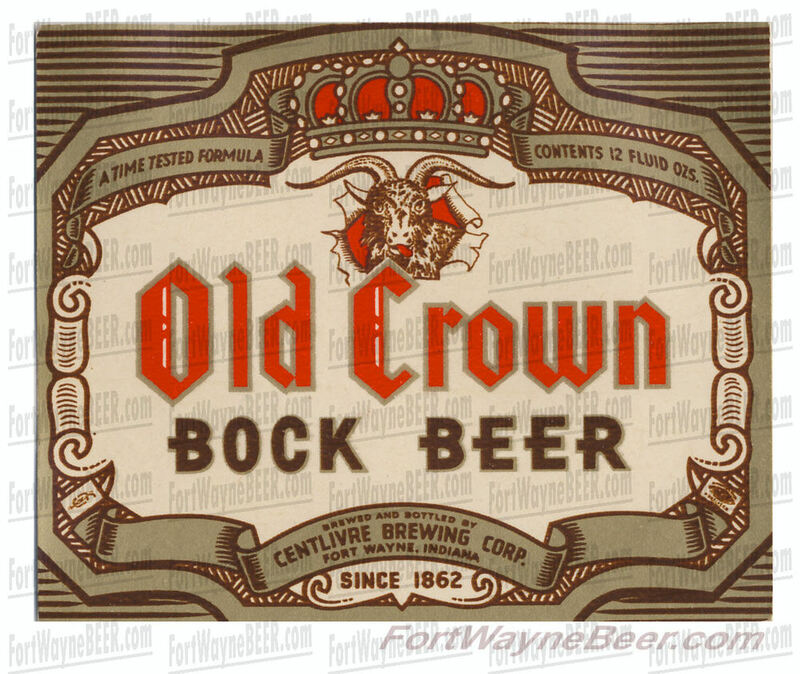 Old Crown Brewing Corporation purchased labels from the Renner Brewing Company of Youngstown, Ohio upon its closing in 1962. 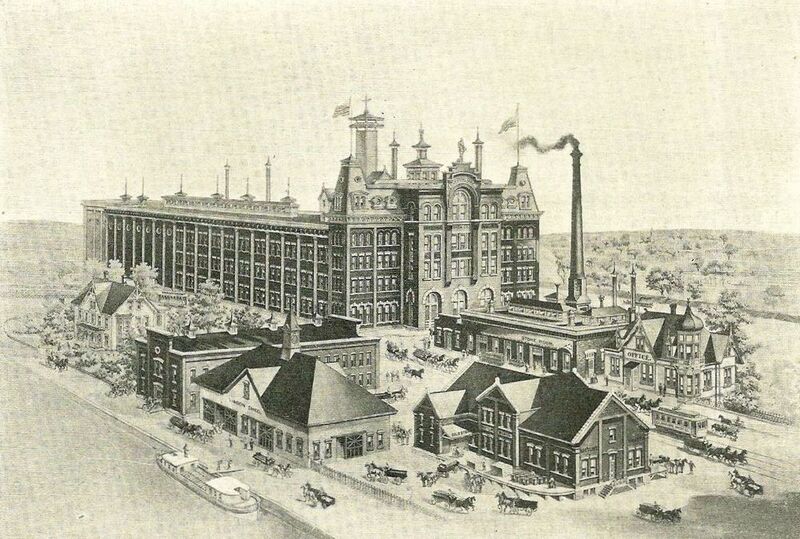 Renner Brands produced in Fort Wayne included Old Oxford, Golden Amber, Old German and Kings Brew. Old Crown also produced Van Merritt from the early '60s until its closure. Like many other regional breweries in the early '70s, Old Crown found competition from large national breweries to be too much. 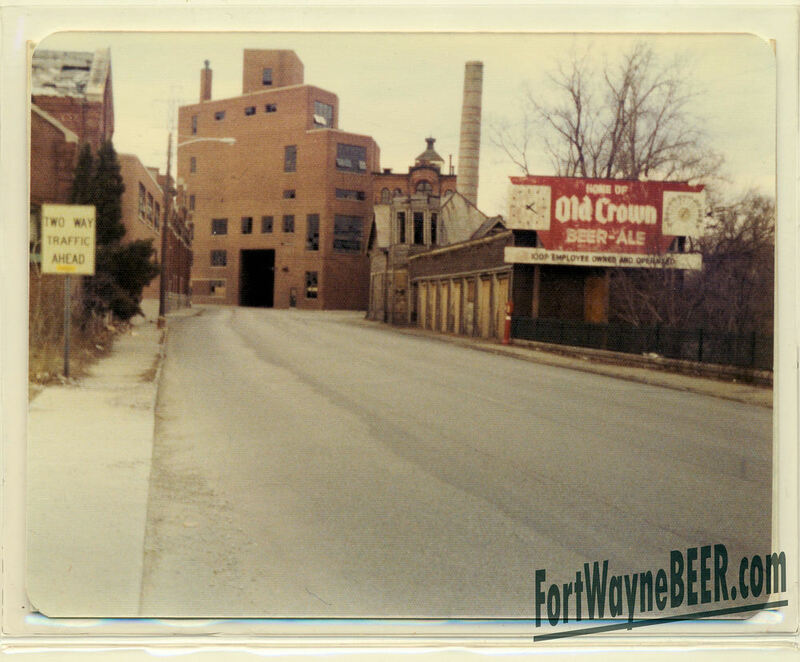 Old Crown Brewing operation, located at 2501 -2531 Spy Run Avenue, closed its doors for good on December I, 1973. The clock on the west side of the brewery remained at 9:23 for almost another two decades. All of its labels were picked up by The Peter Hand Brewing Company and were produced until that brewery closed in 1978.The equipment from the Old Crown Brewery was stripped out and sold. Karl Jensen, a local investor purchased the brewery buildings and land. Jensen's plan included converting the brewery into apartments with retail space and a restaurant in the lower level. The renovations never took place, and after years of vandalism and neglect, the property was condemned. The remaining brewery buildings came down in 1991. Today the Fort Wayne RiverGreenWay Bicycle Trail meanders along the river’s edge where the brewery once stood, and a used car lot occupies the land where the Centlivre family once built a great part of Fort Wayne's history. 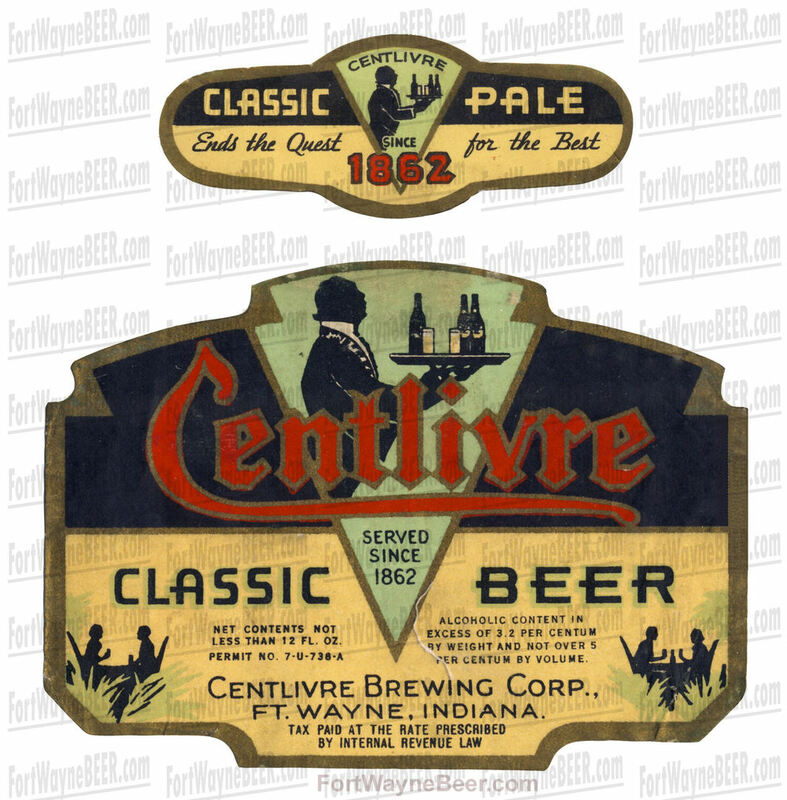 During its 111 year life, the Centlivre Brewery produced a huge volume of promotional items that have now become very much sought after by collectors. Below is just a small sampling of what is out there. Check back often, I will be adding to this collection.